Blondies are the lighter colored counterpart to brownies. 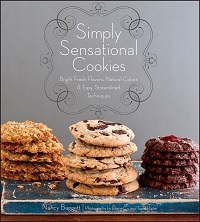 They’re dense, chewy bar cookies that have a fudgy texture similar to that of a brownie, but without any chocolate. These Vanilla Bean Blondies have that deliciously chewy texture that you want in a blondie with a whole lot of vanilla. I used a whole vanilla bean in this batch, which gives them an amazing vanilla flavor and lots of enticing vanilla specks. The bar cookies are easy to make. They only have six ingredients – including the vanilla. Like many brownie recipes, the recipe does not call for baking powder or baking soda. The leavening can make these cakey, but omitting it keeps them chewy and dense. 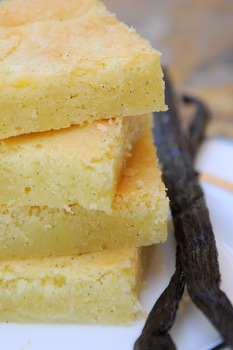 The vanilla bean you use should be plump and fresh, which will make it easy to work with. You simply split it down the center with a sharp knife, then use the back of the knife (or a spoon) to scrape out all of the seeds inside. Leftover vanilla pods can be used to make vanilla sugar, so don’t through them out after you’re finished with them! It is pretty indulgent to use a whole vanilla bean in a small batch of blondies since vanilla beans can be a fairly expensive ingredient. 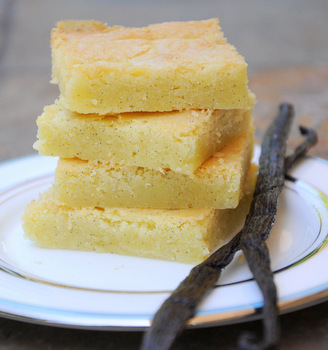 If you don’t want to use a whole vanilla bean, I recommend using half a vanilla bean – which will still give a great look to your blondies – and adding in a half teaspoon of vanilla extract to ensure that these still pack the same tremendous vanilla flavor. You could also sprinkle some vanilla sugar on top of the batch before baking to add a little crunch and yet another layer of vanilla. Split the vanilla bean lengthwise with a sharp knife and use the back of the knife to scrape out the vanilla seeds. Add to the sugar mixture. Beat in salt and egg until well combined. Add in flour and stir until just until no streaks of dry ingredients remain. 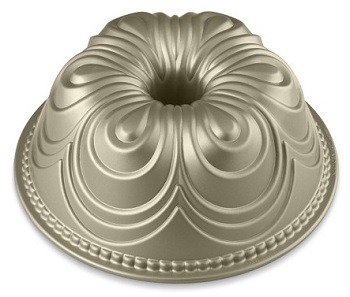 Pour dough â€“ it will be thick â€“ into prepared baking dish and smooth it into an even layer. Bake for about 30 minutes, until bars are set and the edges are just lightly browned on top. Cool completely in the pan before lifting the bars out using the aluminum foil and slicing. These are absolutely delicious. We’re baking them for the second time today! Thanks for sharing! Instead of the vanilla bean could you use Bourbon Vanilla extract and if so how much in place of the bean? Tee – You could substitute 2 teaspoons of vanilla extract in place of the bean in this recipe. Don’t over cook these. They still taste great but are more like crunchy cookies than brownies at that point.